“Tony’s has the BEST steak I ever tasted. My hole family love’s it! It also have’s my favrit soda and they give you FREE bread! And they can give you sea food and free salads. You can watch tv too! They can cut the food for you and they have french fries. 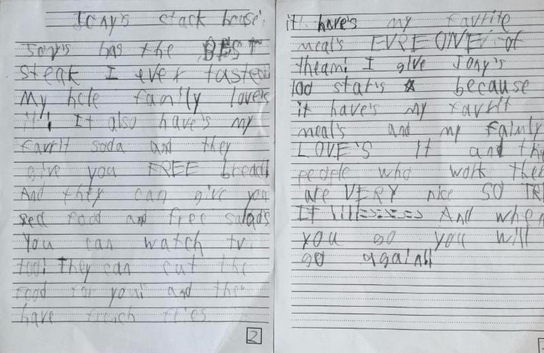 It have’s my favrite meat’s EVERY ONE of theam! I give Tony’s 100 star’s because it have’s my favrit meals and my faimly LOVE’S it and the people who work there are VERY nice so try it!!!! 🙂 🙂 🙂 🙂 And when you go you will go again!! Ryan, Tony thanks you very much for your kind words. He said it’s the best review he’s ever read. The next time you are at Tony’s, make sure he knows you are there. By the way, look us up in about 15 years; there may very well be a marketing position for you in our corporation. 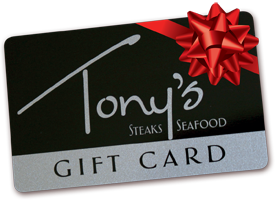 Tony’s gift card may be small, but the gift itself is big! Make your holiday shopping easy with a click of a button. Simply visit our gift card stores and in a few easy steps, all your holiday shopping can be complete. You can do this all from the comfort or your own home or we would be glad to assist you. Stop on by or call us at either location for assistance. Gift cards can be purchased and used at either restaurant. Let Tony’s take you to Italy for the evening. 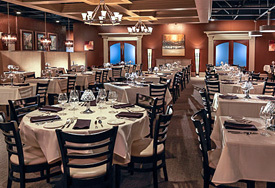 Our upcoming wine dinner will feature a five course meal paired with wines from the Piemonte and Veneto regions in Italy. Please join us as Ian Pascoe from Vintage Wines gives us insight on several distinguished wines as we dine on Executive Chef Mike Nelson’s imaginative courses. Cost for the event is $150.00, excluding tax and gratuity. Seating is limited and reservations are only taken by phone. Please call Emily or Jenna at 513 677-1993 to reserve your table today. You can tell your friends for years to come–you were in the first elite group to ring in the new year at Tony’s. Reserve a table and choose from our most popular entrees. Everyone will enjoy our hand dipped chocolate covered strawberries for dessert, and, if you decide to ring in the new year with us, you will receive a complementary champagne toast. Please note that reservations will only be taken by phone. Starting November 23th, please call Annie between the hours of 10 a.m. and 3 p.m., Monday through Friday. Now in it’s 6th year, Tony’s of Cincinnati knows how to ring in the new year! Join us for a Cincinnati tradition: a selection of our most popular appetizers and entrees along with hand-dipped chocolate covered strawberries. If you decide to ring in the new year with us, you will receive a complimentary champagne toast. Please note that reservations will only be taken by phone. Starting November 23th, please call Emily or Jenna between the hours of 10 a.m. and 3 p.m., Monday through Friday. We will be taking Thanksgiving off to be with friends and family. We look forward to seeing you on Friday! Everything was amazing. Felt like home with better food. The place was packed and rocking! Steaks were cooked perfectly. We all but fought over the brussel sprouts side dish. Excellent meal!